That's no good at all, and it's about to get much worse. Beginning in February, Bleacher Report, a recent Turner acquisition and a spam farm on its best days, will provide online sports content for CNN, a role that had long been filled by the network's distinguished corporate sibling, Sports Illustrated. What is a discerning reader to do? Fortunately, Chrome and Firefox users have options, at least when it comes to how Google handles queries made from the search bars of those browsers. By changing a few defaults, you can block Google from returning any results produced by Bleacher Report's SEO alchemy. Update: We've found an even easier way to do this that works on any browser. See below. Hit OK, and hover over your new search engine. Click the "Make Default" button, then give it a try by searching in the address bar (what Google would prefer you to call the "omnibox." You can make sure it's working by Googling for, say, "Bleacher Report." All done! Enjoy your newly improved web searches. 1. Close Firefox. Open the Finder. Browse to your Applications folder, and find Firefox. 2. Right click on Firefox.app, and choose "Show Package Contents." 3. Find your way to Contents->MacOS->searchplugins->google.xml. Open this in TextEdit. 5. Open Firefox and test it out! Note: Because this file is inside Firefox.app, you may need to perform this every time Firefox is updated. It can be done on Linux, too, but the location of your google.xml file will differ based on distribution. Mine's located in /usr/share/firefox/searchplugins/google.xml. 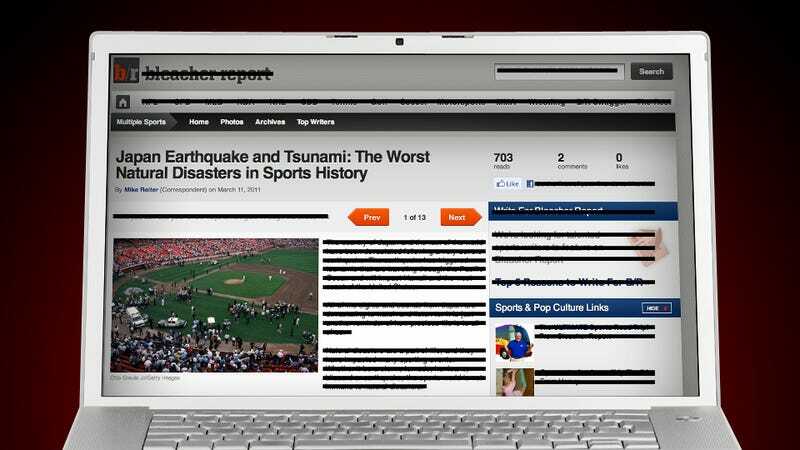 Remember, this only blocks Bleacher Report on searches made from the Chrome or Firefox search bars. If you go to Google.com and input a query there, it won't work. It doesn't appear the default Google search can be modified in Safari, because it's hard-wired into the executable file; if you use Internet Explorer, well, Bleacher Report is hiring. Update (12:46 p.m.): A post below by ukuleledan suggests simply using Google's built-in blocking service. It requires you to be logged into Google, but go here and add bleacherreport.com to the blocked list.